Many of us have great difficulty letting go. Letting go closely resembles quitting or giving up, yet these are not synonymous. Unfortunately, knowing this doesn’t free our thoughts and feelings from relating them. I, for one, am terrible at letting go of things I love and value. I don’t want to let go of things that give me comfort or allow me to experience that feel good feeling. But how often are the things in life that we love and value actually harmful? How many of us love someone who often hurts us? How many of us find comfort in our daily routines, afraid to step out into something different? 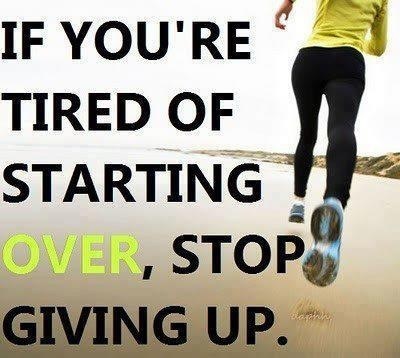 Yet sometimes we easily give up – for example on diets, exercise regimes, Bible studies, school, jobs, etc. It is almost as if we hold onto what is easy and give up on what we perceive as hard…and then often finding ourselves needing to start over. I think that something can be said about allowing something other than God to have too much control or power over our feelings of happiness and comfort. With all the significant change I have been going through recently, it often feels like I’m quitting time and time again. I am one who sticks to commitments through the dire end. But I have been in a few situations that have challenged my morality and integrity – both as a professional and as a woman – and in which I have had to strongly consider letting go of those commitments. How do we know for ourselves when we are letting go rather than giving up? One way of thinking about this is to think of letting go as an act of giving it to God. I’ve had a couple of relationships that I have had to let go of this past year. I can honestly say that I let go, because I implemented some healthy boundaries and I put the next steps in those relationships into God’s hands. I also equate giving up to being easy to do and letting go to being more difficult. Lastly, I would say that giving up leaves me feeling uneasy, whereas letting go provides a sense of relief. What are some of the reasons we quit or give up? I am known to quit when I think that I am not good at something, feel like I’m not perfect and as a result will fail. I tend to quit, kidding myself that when it is my choice it is easier to cope with the failure. The truth is, it’s not easier. Another truth is, I am more than likely NOT failing at whatever it may be. So how do you know you are letting go versus giving up? I think we all need some assistance clarifying the difference.